Like many of our readers, I watched countless hours of TV during the past couple of weeks. First with the vigil for Pope John Paul II, the magnificent funeral services and finally the thrilling announcement of the selection of Cardinal Joseph Ratzinger – Pope Benedict XVI. It has been a great opportunity to learn more of our Church’s history and the personal stories of the men who lead it. What I didn’t see in any of the listings, however, were classic films about the pope. While the current events from Rome were certainly more interesting than an old movie, there are some memorable depictions of popes in Hollywood films. For instance, Pope Julius II is characterized as a driven, warrior pope in the film The Agony and the Ecstasy (1965). Portrayed by Rex Harrison, the pope convinces Michelangelo (Charlton Heston) to create new frescoes on the ceiling of the Sistine Chapel, despite the latter’s insistence that he only a sculptor. The pope watches as scenes and figures from the Old Testament, first in charcoal outlines and then in bright-colored oil paints atop wet plaster, march across the same chapel ceiling under which the cardinals sat to elect Pope Benedict XVI. Michelangelo labors on his masterpiece for nearly four years, during which a battle of wills develops between the pope and the artist. One pushes the other to finish his work, the other holds true to his art and his love of God. 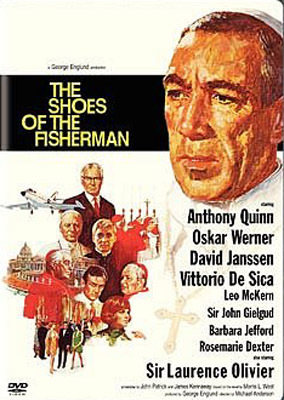 Another pope is humbled by his unlikely election in the film The Shoes of the Fisherman (1968). Anthony Quinn is the Russian Archbishop Kiril Lakota, imprisoned in a Siberian labor camp for more than twenty years. After being released, he is sent to Rome by the Russian Premier (Sir Laurence Olivier) to gain support against the nuclear threat of China. In the midst of a Pontifical Commission examining the writings of Kiril’s unorthodox Jesuit friend, they learn that the Pope has passed away. During the conclave, when voting becomes deadlocked, Kiril is nominated and is quickly elected. Despite his self-doubts, the new Pope is thrown into a battle of political superpowers and has to find a way to bring peace to a world on the edge of a nuclear nightmare. A lighter, sentimental film is Saving Grace (1985), starring Tom Conti as the pope who feels he has lost touch with real people. He longs for the opportunity to do something that really matters and brings unity to the people. He gets his chance when he is accidentally locked out of the Vatican and travels to a small Italian village (obviously before CNN and cell phones!). After befriending a few considered insignificant by the townspeople, he works to rebuild an aqueduct to bring water, and hope, to the village. In the end, he is satisfied that he is in the right place to carry out God’s plan. Listening to God and understanding His plan for each of us is one of the messages in The Accidental Pope (2001). In this novel, cardinals descend upon Rome following the death of Pope John Paul II. During the conclave a cardinal talks about his classmate Bill, an ex-priest and widower who supports his four children with a fishing boat off the Massachusetts coast. Just like the Church threatened by the waves of relativism, the boat carrying Bill’s friends is battered by a raging storm. Yet Bill keeps his head, calms his friends and steers the boat to smoother waters. Either as a joke or a tribute to the cardinal’s “parable,” a majority vote for Bill, who humbly but surprisingly accepts the office. The uneven writing includes lighthearted moments when the first American pope helps his son find a place in the Vatican to skateboard and listens to his daughter talk about the cute Swiss guards. During his years as Pope, Bill deals directly with many of the issues facing the Church today, though the solutions are a little too tidy to be realistic. Today’s Church faces a new century with issues that are neither tidy nor easily condensed into a screenplay. As the world greets Pope Benedict XVI, we watch and welcome his guidance for us all. First published in the April 22, 2005 issue of The Tennessee Register.